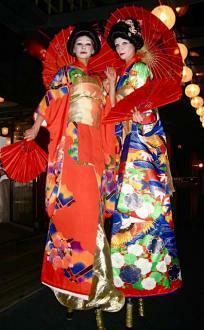 These Geishas are not your ordinary girls, they stand 10 foot high! Take your traditional geisha girl and funk her up. They wear the finest of Kimonos, lavished in gold and silk with elaborate headdresses. They are very effective on the dance floor, lifting the atmosphere of any party or function, synchronising their fan gestures and interacting with guests. Under their delicate parasols they are also perfect for meeting your guests or handing out fortune cookies from their decorated baskets.